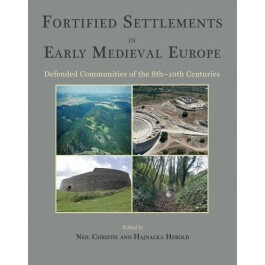 Twenty-three contributions by leading archaeologists from across Europe explore the varied forms, functions and significances of fortified settlements in the 8th to 10th centuries AD. These could be sites of strongly martial nature, upland retreats, monastic enclosures, rural seats, island bases, or urban nuclei. But they were all expressions of control - of states, frontiers, lands, materials, communities - and ones defined by walls, ramparts or enclosing banks. Papers run from Irish cashels to Welsh and Pictish strongholds, Saxon burhs, Viking fortresses, Byzantine castra, Carolingian creations, Venetian barricades, Slavic strongholds, and Bulgarian central places, and coverage extends fully from north-west Europe, to central Europe, the northern Mediterranean and the Black Sea. Strongly informed by recent fieldwork and excavations, but drawing also where available on the documentary record, this important collection provides fully up-to-date reviews and analyses of the archaeologies of the distinctive settlement forms that characterised Europe in the Early Middle Ages. "This book is very well illustrated, often in colour, and the editing is excellent... Overall, it is an interesting volume which brings much new archaeological research and excavation to the fore and provides a critical assessment of our current understanding of early medieval fortified sites across most of Europe. It frequently demonstrates that long-held interpretations based largely on the written evidence are outmoded as the archaeology presents an increasingly complex picture. This emerging evidence offers a valuable opportunity for further comparative research on these over-arching themes in the future." "…a wide-ranging but coherent valuable collection on defended settlements, their contexts and their environments in the early Middle Ages, which will certainly be the starting point for further studies on the topic." "The inclusion of studies and authors from across Europe allows a discussion of similarities and differences within these settlements… The volume itself is produced to a very high standard, with many illustrations and diagrams to complement the text." "This important book fills a substantial scholarly gap...I really enjoyed reading all the papers- an experience which gave me massive food for thought and new ideas." "I find the book very useful and very much needed for ongoing academic research." "The publication provides an excellent and, in many respects, new overview of early medieval fortifications at the junction between early historic fortified settlements and the emergence of the medieval castle." "The book is meticulously edited, adequately illustrated, and neatly produced. It will serve as an inspiration and a reference for students and researchers for years to come. It will do much to restore early medieval fortified sites--and their communities--as a hotspot of archaeological research."